An album produced by an unnamed band. 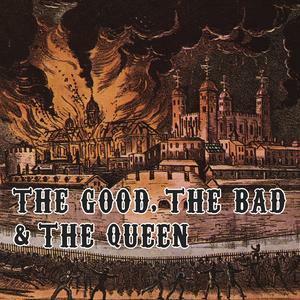 Although they have not an official name, they are known by The Good, the Bad & the Queen, the title of their only album. Normally, I do not go into depths regarding band members, but as they are quite well known I will elucidate the people behind this great music. The band is made up of Damon Albarn, singer of Gorillaz and singer/keyboardist of Blur. Both quite famous bands, the first represents more the genre alternative hip-hop combined with trip-hop and the second one is more alternative and indie rock. Paul Simonon who is the bassist of probably one of the most famous punk band of all times – The Clash. He worked with Albarn at his third album for Gorillaz. The third member is Simon Tong, who plays the guitar and keyboard. He is known for his work with Gorillaz, Blur, The Shining and The Verve. Las but not least, Tony Allen, the fourth member, is drummer, composer and songwriter. He has not worked with a well-known band, though. This well-mixed band produced in the year 2007 a very special album, which I would classify as experimental rock/pop with influences of jazz, blues and electronic music. The opener History Song introduces the listener to the album with a scratchy guitar and melancholic vocals. It creates a moody atmosphere which remains during the entire song. However, it shows clearly that the band was eager trying new things out and combining different genres. The beginning of the third track, Northern Whale, reminds me a lot of Gorillaz, as electronic tunes are very dominant in the first seconds and the Albarn’s voice has this dull and to some extent robotic touch. Although while listening longer to the song this similarity disappears slowly, it shows up again with the fast played keyboard tunes, which lends the slow and lethargic song some speed. When listening to the lyrics carefully, you realise that not only this song evolves about war and the aftermath of war. This theme obviously underlines the gloomy and dragging vibe. The end of Northern Whale is quite special as you get the feeling that the band tries out every instrument at the same time. Listening to this, I often imagine a cloudy sky and due to the sun shining through it, creating a galvanic ambience. Herculean is one of my favourite songs of this album as it combines melancholy, resignation and a dub soundscape. The beginning is a bit powerful and almost uplifting until the vocals with a monotonous voice set in. It creates almost a mystical atmosphere. Soft and almost ghostly voices fade slowly away until the song ends. One could say that Green Fields, second last song on this album is a ballad. And this track shows once more that this album varies with instruments and genres almost every song. It is definitely not an album where one can say that after listening to one song you will know the rest. The songs are unique and very special.